Mark Canton (born June 19, 1949) is an American film producer and executive. Canton was born to a Jewish family in Queens, New York, the son of Shirley and Arthur Canton, who worked in the film industry on marketing and publicity - including such films as Lawrence of Arabia. As a young adult, he met well known movie personalities like Alfred Hitchcock, David Lean, and Doris Day when they visited the family's apartment. After working in the mail room of Warner Bros. while studying at the University of California, Los Angeles, Canton started working for 20th Century Fox and later had jobs with film director Franklin Schaffner, with producer Jon Peters, and in the 1970s as executive assistant to Mike Medavoy at United Artists, before working as executive vice president at Warner Bros. from 1980 onwards. Successes he was involved in at the time include 1983's National Lampoon's Vacation, Purple Rain, and the Batman and Lethal Weapon film series, but also notorious box office failures like The Bonfire of the Vanities (1990), a picture he described as "the best movie I ever saw" at its first screening. In 1991, Canton quit Warner Bros. where he was executive vice president of the Worldwide Motion Picture Production unit. Warner Bros. let him out of his contract fifteen months early with studio head Bob Daly saying "from our standpoint this was a job that was going to be eliminated." He then became chairman of Sony's Columbia Pictures (later Columbia-TriStar Pictures), where he was involved with some failures like Geronimo: An American Legend, but also with blockbusters such as Men in Black, Air Force One, and My Best Friend's Wedding. Canton was fired by Sony in 1996, after a series of relative flops including Last Action Hero (a film Canton described as "probably the best action movie of all time") and The Cable Guy, before his final string of movies could become blockbusters. Described at the time as both "known for enthusiasm, rapid-fire talk, a sleek Italian wardrobe and a youthful style" and "a braggart who was lucky to have become chairman of a studio in the first place", Canton was in those years "one of the most powerful executives in Hollywood". In 1998, Canton became an independent film producer, with Jack Frost starring Michael Keaton as his first major production. Backed by the German company Senator Entertainment from August 2000 onwards, he struck a first-look deal with Warner Bros. By the end of 2001, the shares of Senator had dropped substantially and Canton had to close down his production company. In 2002, he was the chief executive of Artists Production Group, the movie branch of Artist Management Group. After leaving APG in November 2003, he created Atmosphere Entertainment together with Mark Kimsey, an investment manager. The aims were to produce films and television programming. With this company, he produced blockbusters such as 300, Immortals, and The Spiderwick Chronicles. In his roles as executive, chairman, and producer, Canton has been involved in over 300 major Hollywood productions. 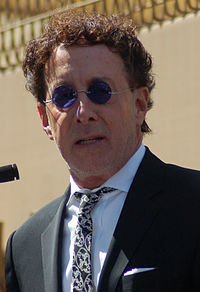 Canton was married to Oscar-winning producer Wendy Finerman, with whom he has three children. His brother is the film producer Neil Canton. They co-produced the 2000 film Get Carter. ^ Brady, Celia (April 1990). "Vain Man: Why Guber-Peters May Bomb in Tokyo". Spy Magazine. p. 42. Retrieved November 15, 2017. ^ a b c d e Weinraub, Bernard (February 8, 1994). "Film Boss Rules the Stars With His Awe". The New York Times. Retrieved November 4, 2008. ^ a b Weinraub, Bernard (October 4, 1991). "From Errand Boy to Studio Chief". New York Times. Retrieved November 4, 2008. ^ a b c Lyman, Rick (February 20, 2002). "It's a Rare Scene: Movie Executive With 9 Lives; From Warner Brothers to Columbia, and, Now, Paired With Ovitz". The New York Times. Retrieved November 4, 2008. ^ Andersen, Kurt (July 5, 1993). "How To Run a Movie Studio". Time. Retrieved November 11, 2008. ^ Griffin, Nancy; Masters, Kim (1996). Hit & Run: How Jon Peters and Peter Guber took Sony for a Ride in Hollywood. Simon & Schuster. p. 367. ^ Fabrikant, Geraldine (September 6, 1991). "THE MEDIA BUSINESS; Vice President Is Leaving Warner Brothers". The New York Times. Retrieved November 4, 2008. ^ Busch, Anita M. (July 10, 1997). "Canton's Sony Roundabout". Variety. Retrieved November 4, 2008. ^ Masters, Kim (September 23, 1996). "Water Torture". Time. Retrieved November 4, 2008. ^ "Inside Moves". Variety. March 17, 1998. Retrieved November 4, 2008. ^ Harris, Dana; Dunkley, Cathy (October 21, 2001). "Canton fires staff, Senator backing out". Variety. Retrieved November 4, 2008. ^ "Mark Canton Forms Atmosphere Entertainment MM LLC". BusinessWire. December 10, 2003. Retrieved November 4, 2008. ^ Mitchell, Peter (August 5, 2005). "Simon the Star". The Age. Retrieved November 4, 2008. ^ "Caddyshack (1980)". Box Office Mojo. 1982-01-01. Retrieved 2018-02-01. ^ "Die Laughing (1980) - Financial Information". The-numbers.com. Retrieved 2018-02-01. ^ "Jack Frost (1998) - Financial Information". The-numbers.com. Retrieved 2018-02-01. ^ "Get Carter (2000) - Financial Information". The-numbers.com. Retrieved 2018-02-01. ^ "Red Planet (2000)". Box Office Mojo. 2002-08-28. Retrieved 2018-02-01. ^ "Angel Eyes (2001)". Box Office Mojo. 2002-08-28. Retrieved 2018-02-01. ^ "Trapped (2002)". Box Office Mojo. Retrieved 2018-02-01. ^ "Taking Lives (2004)". Box Office Mojo. Retrieved 2018-02-01. ^ "Godsend (2004)". Box Office Mojo. Retrieved 2018-02-01. ^ "George A. Romero's Land of the Dead (2005) - Financial Information". The-numbers.com. Retrieved 2018-02-01. ^ "300 (2007)". Box Office Mojo. Retrieved 2018-02-01. ^ "Full of It (2007)". Box Office Mojo. 2007-03-08. Retrieved 2018-02-01. ^ "The Spiderwick Chronicles (2008)". Box Office Mojo. 2008-05-08. Retrieved 2018-02-01. ^ "A Perfect Getaway (2009)". Box Office Mojo. 2009-09-17. Retrieved 2018-02-01. ^ "Fame (2009) - Financial Information". The-numbers.com. Retrieved 2018-02-01. ^ "Letters to Juliet (2010) - Financial Information". The-numbers.com. Retrieved 2018-02-01. ^ "Piranha 3D (2010) - Financial Information". The-numbers.com. Retrieved 2018-02-01. ^ "Immortals (2011)". Box Office Mojo. 2012-02-23. Retrieved 2018-02-01. ^ "The Cold Light of Day (2012) - Financial Information". The-numbers.com. Retrieved 2018-02-01. ^ "Piranha 3DD (2012)". Box Office Mojo. 2012-06-21. Retrieved 2018-02-01. ^ "Freelancers (2012) - Financial Information". The-numbers.com. Retrieved 2018-02-01. ^ "Black November (2015) - Financial Information". The-numbers.com. Retrieved 2018-02-01. ^ "Escape Plan (2013)". Box Office Mojo. Retrieved 2018-02-01. ^ "300: Rise of An Empire (2014)". Box Office Mojo. 2014-05-29. Retrieved 2018-02-01. ^ "Cake (2015)". Box Office Mojo. 2015-02-19. Retrieved 2018-02-01. ^ "Outcast (2014)". Boxofficemojo.com. Retrieved 2018-02-01. ^ "The Pyramid (2014)". Box Office Mojo. Retrieved 2018-02-01. ^ "The Last Witch Hunter (2015)". Box Office Mojo. 2015-12-31. Retrieved 2018-02-01.